1) At 0-50 milliseconds (ms): As the car is initially propelled forward, the seatback pushes the torso forward while the head remains in its original position, which straightens or flattens out the cervical curve. 2) At 50–75 ms: As the torso accelerates forward, the head/neck moves backwards forming an S-shaped curve with flexion of the upper cervical region and extension of the lower cervical region, stressing the ligaments in back (upper) and front (lower) cervical spine regions. 3) At 150-175 ms: The torso is at its maximum forward position in reference to the neck and the head/neck is forced into peak extension (backward bending). The head may contact the head restraint or ride over it if of the torso slides up the back a reclined seat. This can further damage the ligaments in the front of the cervical spine. 4) At 200-600 ms: The head and torso are then thrown forward by the rebound off the seatback, hyperflexing the neck (and mid- and/or low-back) and potentially causing further injury to the ligaments in the back of the spine. Depending on whether or not a seatbelt is in use, the head may strike the steering wheel and/or windshield causing further injury. It may seem logical to think that if we can anticipate an impending MVC, then less injury will occur. Unfortunately, this doesn’t hold true because the total length of time it takes for the sequence described above to occur is about 600 ms and we cannot voluntarily contract our muscles in less than 800-1000 ms. Therefore, you simply won’t have time to brace yourself for impact. If cervical rotation occurs at the time of impact, such as looking into the rearview mirror, then the risk for injury may increase. There is recent evidence suggesting that it is difficult to avoid rotation of the cervical region during a collision because the diagonal path of the chest restraint promotes trunk rotation in the later stage of whiplash as the torso rebounds forward. Nonetheless, looking straight ahead at the time of impact may reduce the degree of injury in some collisions. To achieve the best long-term outcome, treatment should emphasize movement and exercise as soon as possible. 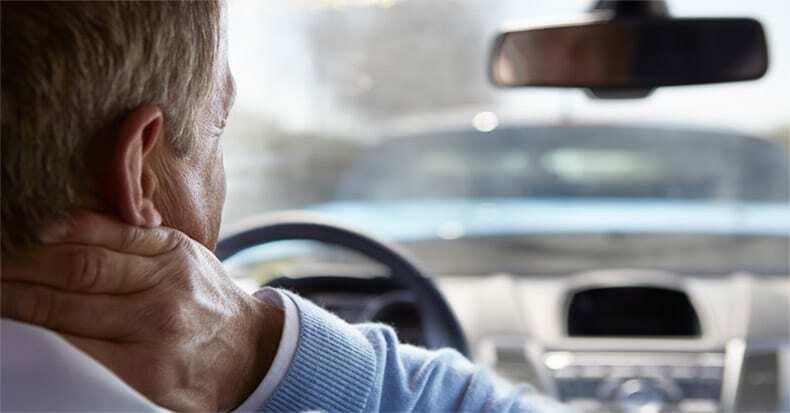 In addition to treatments performed in the clinic, doctors of chiropractic commonly recommend whiplash patients to perform home exercises, home cervical traction, and other self-help methods with the objective of returning to a normal lifestyle as quickly as possible.